Front end barcode optics circuit and magstripe circuit. 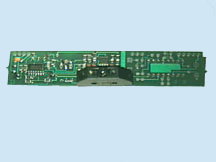 The 101 board is a small bar code/magnetic stripe front end board, designed to be used in oem equipment. Barcode output may be either open collector or TTL; magnetic stripe output is clock/media/data. Board size is approximately 0.6" x 4".